Helps moisturize and soothe dry noses due to: colds/ flu, allergies, winter dryness, low humidity, CPAP/ BiPAP, chronic sinusitis, flying, nosebleeds, oxygen therapy. 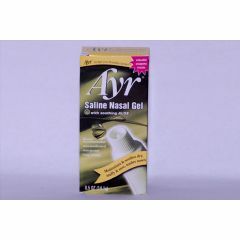 AllegroMedical.com presents The AyrNasal Gel. Helps moisturize and soothe dry noses due to: colds/ flu, allergies, winter dryness, low humidity, CPAP/ BiPAP, chronic sinusitis, flying, nosebleeds, oxygen therapy.